Retrospect Management Console enables you to monitor and manage up to 100 instances of Retrospect from a single interface. You’ll be able to see which sources are protected and which needs your attention, from your desktop browser or mobile device. Retrospect Backup 16 for Windows or Mac is required. Retrospect Management Console enables basic monitoring from anywhere for every Retrospect Backup 16 engine with complete monitoring and management available for each engine with the Management Console Add-on. It is a hosted service with in-transit and at-rest encryption, enabling businesses and partners to securely monitor and manage their backup environment. See details. We will walk through integrating Retrospect Backup with Retrospect Management Console. With Retrospect 16, you can enable the Management Console directly in the UI Preferences. Sign up for a Retrospect Management Console account and save the organization UUID. Ensure that the application has a license. Navigate to the Preferences. On Windows, it’s available on the left navigation. On Mac, it’s available in the toolbar menu. 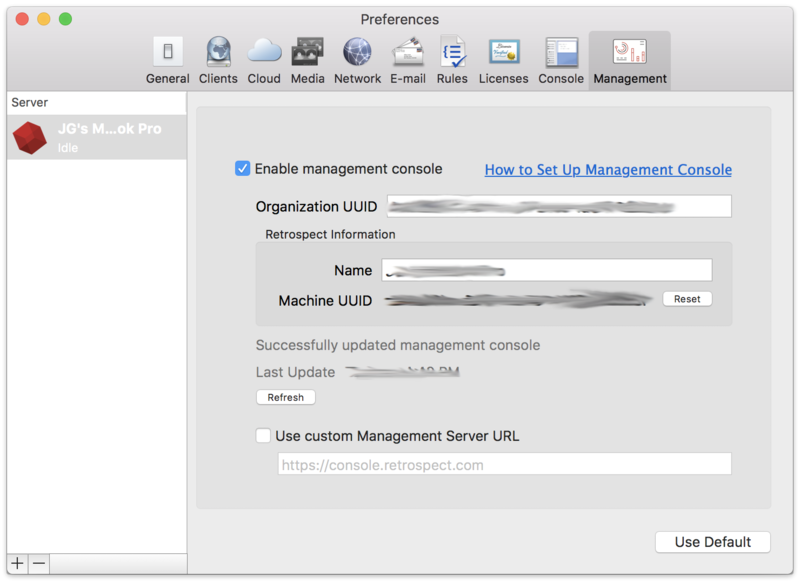 Check "Enable Management Console" and fill in the "Organization UUID" from your Retrospect Management Console settings. Close Preferences. The engine data will show up in your Retrospect Management Console account, and you’ll see the "Last Updated" status show the last time the data was sent. There is also a status message to help troubleshooting. Retrospect Backup communicates with the Management Console using HTTPS, so the port is 443. As it’s the same as HTTPS web traffic (like Gmail and Amazon), it’s not generally blocked. If the firewall white-lists domains, "console.retrospect.com" will need to be added. 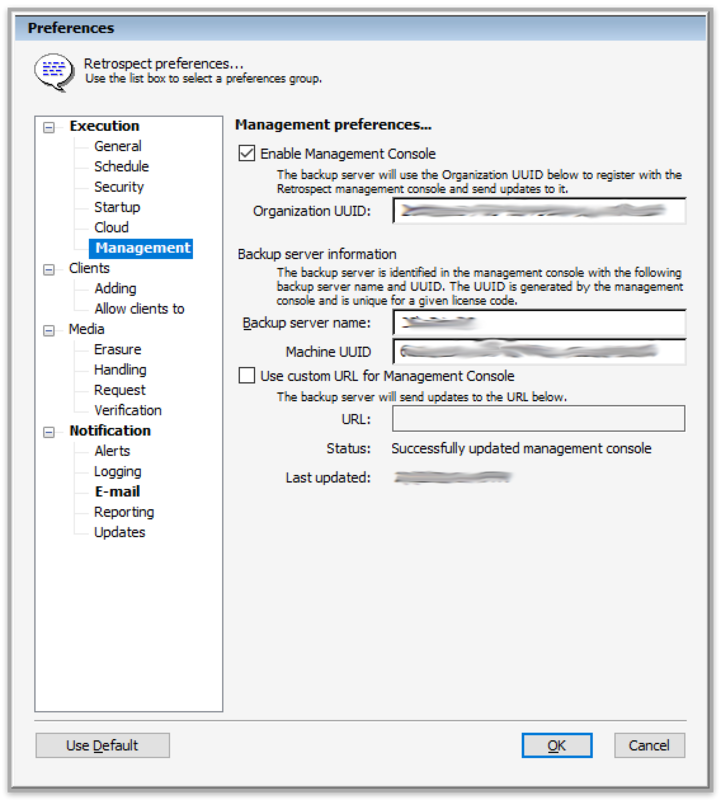 The Retrospect Management Console uses the organization UUID to link a Retrospect Backup instance to the correct organization. Within the organization, the Retrospect Backup application license is used to uniquely identify the data for that instance. If the application license is used by more than one instance (for example, re-using a trial license), then the data from the most recent communication from one of those instances will appear. When configured, Retrospect Backup communicates with the Retrospect Management Console every minute. To disable it, repeat the above steps and uncheck "Enable Management Console".